Continue your sewing journey. This class is meant for you to take your beginner skills and make them more mature. 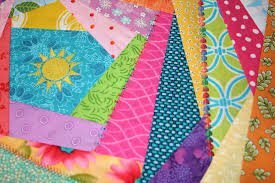 In this camp, you'll make a crazy quilt tote bag and a rag quilt. Pre-requisite 1 session of Hip Stitch Kid's Beginning Sewing Camp or 10 hours of private lessons. This camp includes 5 half-days and is intended for children who will be entering the 3rd grade in the 2019-2020 school year through age 14. Skill Details: Must have taken Kid's Beginner Sewing Camp or equivelent. Hip Stitch will have a machine available for use by each student. However, student's may use their own machine as long as they are familiar with it and it is in good, working, order. Or, we'll sell you one of our student machines, the EverSewn Charlotte at a special discounted price just for you! Materials Included: Cost includes snacks and scrappy pieces for totebag. 15% off all fabric and notions purchased for class.